A generally poor weekend with fading surf Saturday and less than ideal winds, while Sunday winds were again not too favourable and with a very inconsistent building W'ly groundswell. This morning is a little better with a mix of easing W/SW and SE windswell with cleaner conditions across the beaches, best east of Melbourne and to 2-3ft. The exposed beaches will clean right up tomorrow with a N/NE offshore but swell wise, it'll be small, inconsistent and fading. A background W/SW swell may provided 2ft sets on the Mornington Peninsula through the morning, but very inconsistent and easing through the day. The Surf Coast will be tiny. A low point in swell will be seen Wednesday morning with N/NE tending N'ly winds, but later in the day our new W'ly groundswell should start to show as winds tend W/NW, with a peak in size expected on Thursday. This swell has been and is still being generated by a strong polar front pushing up towards WA from the Heard Island region on the edge of our swell window, with it currently moving east under WA while still generating a good fetch of gale-force W/SW winds. The storm will dip south-east through the day today, out of our swell window, leaving a moderate sized W'ly groundswell to travel towards us, arriving later Wednesday and peaking Thursday morning. The Surf Coast may see sets reaching 2-3ft at magnets by dark if we're lucky, though keep your expectations low, with a peak Thursday morning to an infrequent 3ft+ at magnets, much much smaller in more protected spots. The Mornington Peninsula will see more size with sets to 5-6ft expected. Also in the mix will be a building mid-period W/SW swell from a weak front moving in and across us early Thursday morning though not above the size of the existing groundswell. This front will bring poor winds though with a SW tending S/SW change (likely W'ly early around Torquay) and S'ly into the afternoon. With the average westerly swell direction and poor winds, this doesn't look to be a surf day. A high moving in behind the front will swing winds around to the E/SE-E on Friday with a new long-period W'ly groundswell. This won't create the best conditions, but there should be some workable options across the state. The new groundswell will be generated by a secondary vigorous front piggy-backing on the back of the current storm passing under WA, generating a fetch of gale to severe-gale W/SW winds through our western swell window again. An additional polar fetch of strong W/SW winds at the base of this front should also add a mid-period SW swell component to the swell, but size wise the Surf Coast looks to maintain inconsistent sets around 3ft on the Surf Coast and 5-6ft on the Mornington Peninsula. The weekend is looking much better but mostly for the beaches as winds swing back to the N/NE along with a mix of easing W'ly groundswell from Friday and new reinforcing W/SW groundswell from a pre-frontal fetch of W/NW gales moving in from the Indian Ocean, down under the country towards the polar shelf. 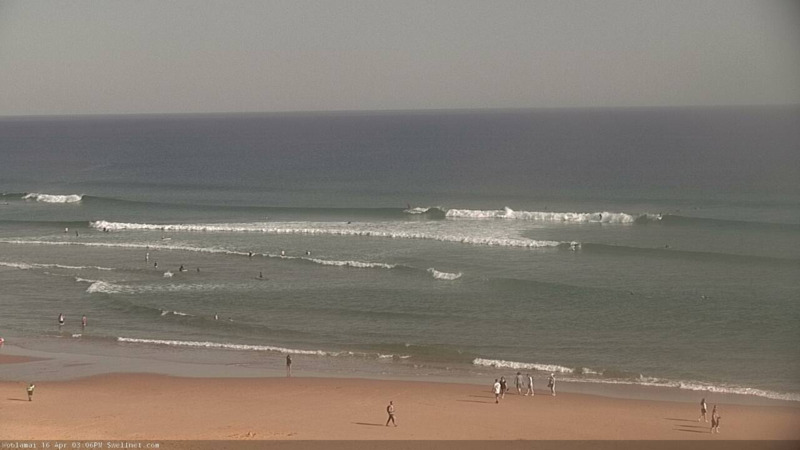 The Surf Coast should hold around 2-3ft at magnets most of the day with 4-5ft sets to the east. Sunday will become smaller into the early morning though be clean again on the beaches with a N-N/NE offshore. A new reinforcing pulse of inconsistent W/SW groundswell is due through the day though, produced on the backside of the pre-frontal W/NW fetch, with a tight fetch of severe-gale to storm-force W/SW due to be projected through our far western swell window, south-west of WA. An inconsistent 3ft wave should develop during the day on the Surf Coast magnets, 4-5ft on the Mornington Peninsula and winds will tend NW into the afternoon ahead of a late S/SW change. Longer term the outlook remains tricky and unfavourable for the Surf Coast with lingering onshore S'ly winds Monday and a mix of small to moderate W/SW swells, fading Tuesday under a NE breeze. 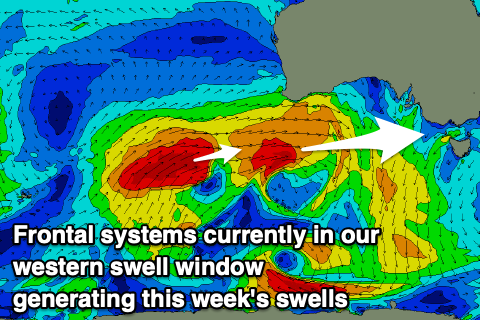 Later in the week we may see some better W/SW groundswell but we'll have to review this Wednesday. So with that forecast one would have to assume they won't be running it at bells anytime soon? Yeah it has a touch. It could boost the Surf Coast to 3ft to possibly 4ft into the afternoon. Looking lovely east of Melbourne today.